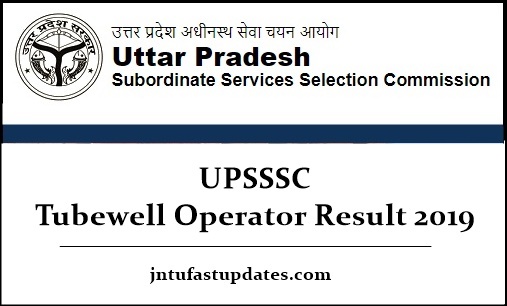 UPSSSC Tubewell Operator Result 2019: Uttar Pradesh Subordinate Service Selection Commission (UPSSSC) organized the tubewell operator/ Nalkoop Chalak written test on 12th January, 2019 in many examination centers across the state. A large number of candidates have competed for the tubewell operator posts in the state of Uttar Pradesh. UPSSSC released the tubewell operator answer keys for all sets A, B, C, D. The competitors have checked with the answer keys and estimated the score. Candidates waiting for the tubewell operator posts can stay checking the official website, upsssc.gov.in. The result will be soon announced by UPSSSC. All the competitors who have given the test on 12th January can keep checking the UPSSSC portal for updates regarding result, cutoff marks, and merit list. The Uttar Pradesh Subordinate Service Selection Commission (UPSSSC) is the state level government organization looks at various functions of the state. This organization offers various jobs for suitable aspirants. Annually it releases various job notifications to hire the aspirants. The organization has recently announced a notification for 3210 Tubewell operator (Nalkoop Chalak) posts. The organization received a large number of applications from the interested and eligible aspirants. Screening of the aspirants will be done through the written test and interview rounds. Candidates have to clear the written test round to be forwarded for the interview round. UPSSSC offers a good pay scale for the selected candidates. All the competitors who are eager to check UP Tubewell Operator result 2019 can wait for few more days. The organization is expected to roll out the result in the month of February [tentatively]. Soon, UPSSSC will announce the result date on its official website, upsssc.gov.in. All the competitors who have competed for the examination can stay checking the UPSSSC portal to check the result. The cutoff marks/qualifying marks will be announced along with the result. Candidates scoring the qualifying marks as specified will be announced as qualified the written test round. UPSSSC will announce the category-wise cutoff marks (For General, OBS, SC, ST, and others). Candidates have to score as per their category to qualify the exam. UPSSSC tubewell operator exam will have the negative marking of 0.25 marks for a wrongly answered question. Hence the aspirants have to score the qualifying marks despite the negative marking. UPSSSC Tubewell Operator merit list 2019 will be announced by the organization with the names of exam cleared candidates. Candidate’s names specified in the merit list are eligible for the interview round. On the homepage, search for tubewell operator result link. Provide the necessary details such as register number, password etc. UP Tubewell operator result, score, cutoff marks, and merit list will appear on the screen. Sir tubewell operator ka rejelt kab tak aayega ?